The Star Wars novel Thrawn: Alliances hits bookstores at the end of this month and a new excerpt detailing Padme Amidala's mission has been released. Additionally, an exclusive poster featuring Padme has been released and it looks pretty awesome. While there was a time when the prequel trilogy was largely dismissed by Star Wars fans, a younger audience has recently discovered the movies and they have embraced what George Lucas set out to do, which means that a new story including Padme is a pretty big deal. Best-selling author Timothy Zahn's Thrawn: Alliances is the sequel to 2017's Thrawn novel. In the story, Thrawn and Darth Vader team up to stop a threat against the Empire. Continuing from the first novel, it tells the tale of Grand Admiral Thrawn's rise to power and is sure to be a hit with fans of the prequel trilogy. 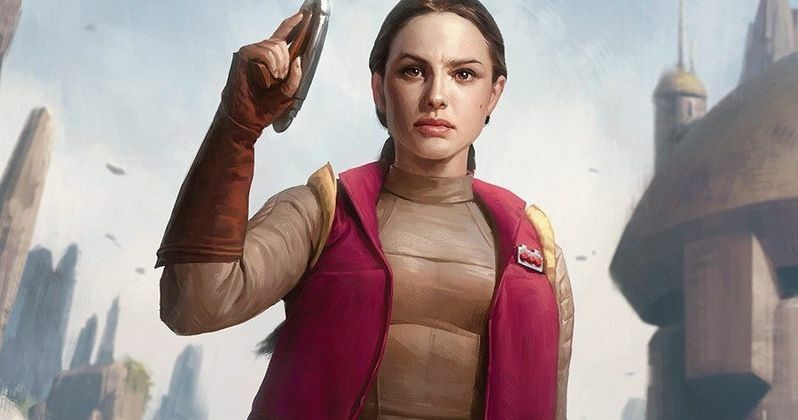 Barnes and Noble has an exclusive poster featuring Natalie Portman's Padme Amidala getting ready for battle and San Diego Comic-Con has an exclusive cover that shows off Thrawn standing next to Hayden Christensen's Anakin Skywalker. In the new excerpt from the Star Wars novel Thrawn: Alliances, Padme Amidala is on a personal mission, fighting for survival. The story obviously takes place before the births of Luke and Leia and focuses on her military prowess. The excerpt details Padme's journey to the planet's surface to "investigate the disappearance of an old friend..." You can read the excerpt for yourself to see what happens next, but it's an intriguing preview of what Timothy Zahn will release to the public on July 24th. The official synopsis for Thrawn: Alliances sees the story going even further into the past than the first novel. The story takes place during the events of Star Wars Rebels and will see the first time that Grand Admiral Thrawn comes into contact with Darth Vader. The two form an uneasy alliance, "neither remotely aware of what their futures held in store." The synopsis reads. "Grand Admiral Thrawn and Darth Vader ally against a threat to the Empire in this new novel from bestselling author Timothy Zahn. The sequel to New York Times bestseller Thrawn, Thrawn: Alliances will continue to follow the rise of Grand Admiral Thrawn to the heights of Imperial power-and accompany him into the past, witnessing his first encounter with the man who will one day become Darth Vader." As previously noted, Thrawn: Alliances hits bookstores on July 24th both physically and digitally. However, for Star Wars fans who buy the physical edition of the book, you can only get the Padme Amidala poster from Barnes and Noble. It should also be noted that they have limited copies, so act fast if you want to get your hands on one. You can read the excerpt from Thrawn: Alliances, which features Padme over at StarWars.com.